Secret Recipe, a lifestyle caf�� chain has become a household name following its debut in 1997. 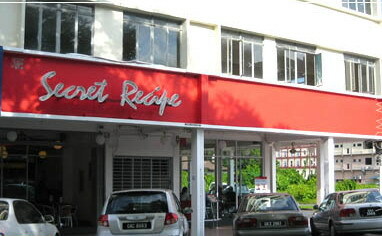 Secret Recipe has successfully established its brand name by virtue of its fine quality cakes, fusion food and distinctive service. Secret Recipe offers more than 40 types of cakes and pastries, over 20 types of fusion food and a flavourful blend of hot and cold beverages. Interesting specialties from different countries are created into Secret Recipe menu, such as Thailand Tom Yum Noodle, Singapore Laksa, English Fish and Chips, Irish Lamb Stew, Malaysian Curry Noodle, Japanese Soba and Vietnamese Beef Noodle. This uniquely variable international flavour food concept incorporates great ease and adaptability for each market in the world to savour great recipes from other cultures around the world and at the same time, able to enjoy a good choice of local authenticity in their meals. Secret Recipe is also famous for its pastries and pies Chicken Cornish, Black Pepper Lamband Shepherd��s. Add : 181/182, Ground Floor, Jalan Song Tian Cheok, Section 51, 93100 Kuching, Sarawak. The weather is hot lately don��t you think? Want something really cold? Finally we have a new place for it. It was launched not long ago. iGloo is situated at the same row as Roseberry. It��s the new shoplots next to 4th Mile Everrise. It not easy to miss its cute signboard. 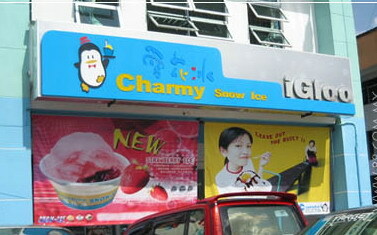 The cheapest snow ice you can get is RM4.80 and the most expensive is RM6(exclude customised ones). The texture of the ice is different, it��s not the same as what you get in ais kacang. They are using Japnese technology to produce this kind of ice. They have fluffy texture. There are more than 5 flavours(chocolate, milk, green tea, coffee, mango, peanut, strawberry and so on). If you would like to have some other desserts, they do offer cakes, puddings and teas. You have to ask the staff about it because they have different desserts everyday. Add : NO.1, Ground Floor Commercial Center, 4th Mile, Penrisson Road,93250 Kuching,Sarawa.